The new 75 m long ship, the 'Atair' will replace her 30 year old namesake, and will be the first German research vessel operating on LNG fuel. Wärtsilä will also supply the engines and SCR systems for three German Federal police boats to be built at the Fassmer yard. The full scope of Wärtsilä's supply for the 'Atair' is two 6-cylinder Wärtsilä 20DF dual-fuel engines capable of running on either LNG or conventional liquid fuels, one 6-cylinder Wärtsilä 20 engine, two exhaust cleaning systems, and a Wärtsilä LNGPac fuel storage, supply, and control system. The engines will have Tier III classification since the dual-fuel engines comply with this classification when running in gas mode, and all the engines will be compliant when operating on diesel because of the Wärtsilä SCR systems. Furthermore, the engines will be double elastically mounted to minimise the noise. This special Wärtsilä technique will enable the ship to fulfil the DNVGL classification society's 'Silent R' rating, thus allowing the sonar equipment to be used without disturbance from underwater radiated engine noise. "Our dual-fuel technology is unique when it comes to small bore medium speed engines, and the extended service intervals and economic fuel consumption of the Wärtsilä 20DF engine enable lower operating costs than is possible with high speed engines. We have worked closely with the Fassmer shipyard and are proud to have once again been selected to supply the machinery and equipment for this important project," says Lars Anderson, Vice President, Engine Sales, Wärtsilä Marine Solutions. "As the new 'Atair' will be the first vessel in our fleet with LNG technology, we rely on the experience and expertise of Wärtsilä with respect to the engines and LNG tank equipment. With Wärtsilä's dual-fuel and SCR technologies, the vessel will fulfil the IMO's Tier III regulations in all operational conditions, whether sailing on LNG or on diesel fuel," says Kai Twest, Head of Ships and Equipment Division at BSH. 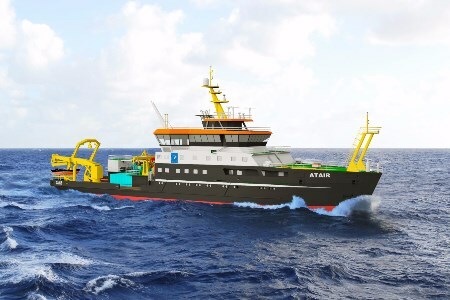 Earlier, Wärtsilä has supplied double elastically mounted main engines equipped with SCR's for the 'Sonne' a deep sea research vessel also owned by the German government. The vessel is operating very successfully in terms of being booked by scientists for research programs due to its modern and environmentally friendly equipment, thereby endorsing Wärtsilä's reputation as a provider of high grade technological and ecologically sound products and solutions.